Installing Google Chrome is the best way to benefit from surfing on internet. Yes, Google Chrome is the most lightweight browser. As a linux user, we know that there're two type of that browser, Google Chrome and Chromium. Chromium is the opensource version of Chrome, and Google Chrome is the proprietary version. When you installed Chromium, you can't installed plugins where available on the Chrome Store, but on Google Chrome it can be. But, there's a problem on Kali Linux, when you installed the latest version of Google Chrome. It's because the newest version of Plugins Flash Player which included on the Google Chrome was not compatible or not stable yet. That version is 11.7 r700. Okay, here i will tell you to fix it. Maybe you want to install Google Chrome at first (read Installing Google Chrome). Before it, you must be installing Hexedit, because on Kali Linux, Hexedit wasn't installed by default (read Installing Hexedit on Kali Linux). After that, on Google Chrome open the new tab and type "chrome://plugins". You'll see several plugins which installed on Google Chrome. 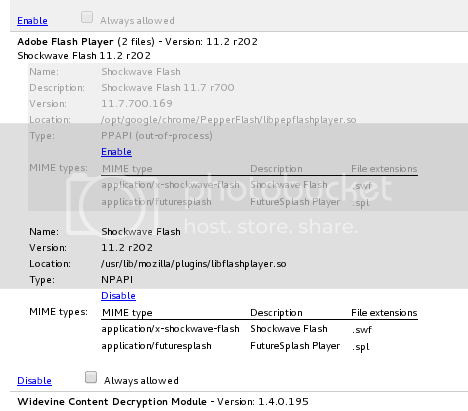 When you have installed Flash Player Plugin for Iceweasel like this post, you will found that Google Chrome was listed two Plugin of Flash Player, the first is the default from Google Chrome (11.7 r700), the second is Flash Player Plugin for Iceweasel (11.2 r202). On my PC which installed Kali Linux, the 11.2 r202 version is more stable than 11.7 r700. I don't know about it, when i use the 11.7 r700 version to open video from Youtube, Google Chrome lacking everytime. But when i use the 11.2 r202, Google Chrome was playing the video normally. So, based on my experiment i choose 11.2 r202 version. To activating just one Flash Player Plugin for Google Chrome, open the plugins of Google Chrome at "chrome://plugins". You can click details on the right side in the window. After that, you will see two Flash Player Plugin listed, disable the 11.7 r700 version. Now, your Google Chrome just use one Flash Player Plugin.